Rivalry and OCR are piling on the cash for new eSports fans. Great games like Counter Strike, Call Of Duty, Dota 2, Hearthstone, League Of Legends, Overwatch, and Starcraft are ready for action. A brand-new online sportsbook has made its way to market, and it's packed with promotional power. 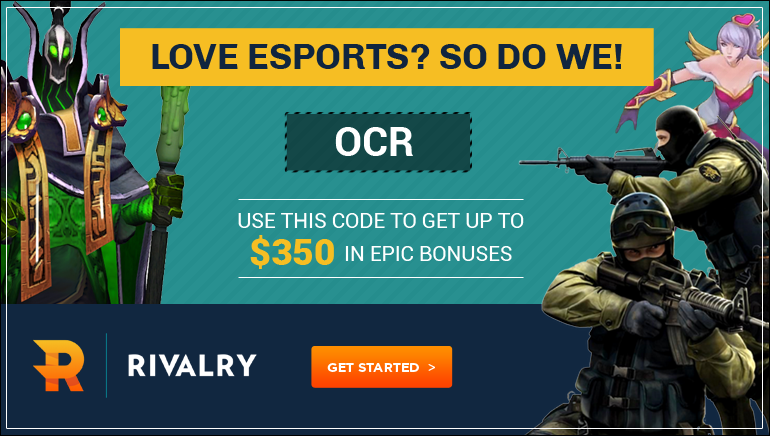 e-Sports fans are in for a real treat, courtesy of Rivalry and OCR. As a new player, a generous series of bonuses is available – valued up to $350 – when using the promo code OCR. Decked out in its signature blue and green colour scheme, Rivalry is the new kid on the block. e-Sports fans get to enjoy a power packed selection of fully regulated gambling games. These include match betting on a host of options such as ESL VIP Adria League, Dreamleague, Ecs League, Esl Proximus Championship and ESL Pro League among others. A combination of live matches, scheduled matches, and exciting events is available to electronic sports betting fans. The VIP Rewards Club is the go-to destination for claiming the generous welcome bonus package valued at up to $350 when using Promo Code OCR. Games include Counter Strike, Call Of Duty, Dota 2, Hearthstone, League Of Legends, Overwatch, and Starcraft. The VIP club can easily be accessed by registering, unlocking missions and levelling up, and then completing missions to earn bonuses. Rivalry eSportsbook is a responsible gaming advocate and fully licensed and regulated by the Isle of Man Gambling Supervision Commission. Players can communicate with one another via Rivalry’s social media platforms on Facebook, YouTube, Twitter, Instagram and others. It's all systems go for eSportsbetting at Rivalry.